House Republicans have made it clear they plan to eliminate the estate tax as part of a broader tax reform effort, but the future of the gift tax remains unknown, leaving estate planners to caution that its fate shouldn’t be taken lightly. Tax practitioners warn that making changes to the gift tax could create undesired tax ramifications or make it easier to avoid taxes using new and existing techniques. The House GOP tax reform blueprint released in June 2016 calls for repealing the estate tax, but doesn’t address the gift tax. “We should never look at a change in isolation,” said Lester Law, a managing director at Abbot Downing’s Naples, Fla., office. “You need to see what else is happening,” said Law, who is a member of Bloomberg BNA’s Estates, Gifts and Trusts Advisory Board. Republicans have taken different approaches to taxing transfers of assets from one person to another. Proposals vary—from ignoring the gift tax entirely to retaining it at a level much like today’s to repealing it altogether. The impact on taxpayers’ behavior and estate planning strategies would vary widely depending on the route Congress and President Donald Trump decide to take. Several estate planners said repealing both the estate and gift taxes—but making no other changes—could have the most significant impact. This idea was proposed in legislation ( H.R. 198) introduced in January by Rep. Mac Thornberry (R-Texas). The gift tax is often viewed as a backstop to the estate tax, and many people think if the estate tax is repealed, the gift tax should be as well, said Steven Lavner, a managing director in the National Wealth Strategies Group at U.S. Trust, a subsidiary of Bank of America Corp. But there are several reasons not to do that, he said. For one, the gift tax also backstops the federal income tax, Lavner said. Without a gift tax, a parent or other individual could give property to a child, probably resulting in its being taxed at a lower rate. When the parent wanted the property back, presumably it could be transferred without any tax consequences, he said. The property could also be gifted to the child tax-free, sold at a lower capital gains rate and the proceeds transferred back to the parent—all without incurring any transfer tax. Even though part of the House GOP’s tax reform proposal is to lower income tax brackets for everyone, lawmakers wouldn’t be “that happy if people were to play games and income-shift,” Lavner said. These problems would be heightened under the House proposal because the plan would reduce today’s seven income tax brackets to three. “The more expansion of those brackets, the more you’d have room to complicate and really frustrate the system,” Lavner said. Wider brackets leave more room for parents to transfer wealth to their children without bumping the child into a higher bracket, he said. Robert J. Lord of Robert J. Lord PLC said he would rather see both the estate tax and the gift tax retained, but if one has to go, the other should also be repealed. “In my mind, you want the estate tax policy to mesh with the gift tax policy,” Lord said. “Every time you have a distortion, you create tax-driven decisions that are generally not good economic decisions,” he said. Unlike Lavner, Lord said he envisions more gaming under a system where the estate tax is eliminated but the gift tax is retained. If that occurs, “what will happen then is people like me will create all kinds of mechanisms to allow people to effectively transfer property but not technically gift it,” he said. Like the House GOP’s tax blueprint, Trump’s campaign proposal didn’t mention the gift tax. However, unlike House Republicans, Trump proposed replacing the estate tax with a capital gains tax on assets held until death and valued at more than $10 million. Lord said this type of system would prevent taxpayers from playing income-shifting games. However, treating gifts as transactions that trigger capital gains will create complications for dynasty trusts, Lord said. Dynasty trusts, in theory, can last forever, and are used to pass wealth from one generation to the next. Most are designed to allow that wealth to grow without incurring gift and estate taxes. Repealing both the estate tax and the gift tax could create a torrent of gift-giving if it appears the estate tax will eventually be reinstated, practitioners said. Wealthy clients could make large gifts tax-free and if the estate tax was revived, they would have moved those assets out of their estates, Lavner said. “So there might be a concern by the government that getting rid of the gift tax would really open the floodgates to major transfers,” he said. Ronald D. Aucutt, a partner at McGuireWoods LLP, said this could be one reason the two main 2017 estate tax repeal bills keep the gift tax intact and only reduce the top tax rate to 35 percent. The House version of the Death Tax Repeal Act ( H.R. 631) is sponsored by Ways and Means Committee member Kristi Noem (R-S.D.). Senate Finance Committee member John Thune (R.-S.D.) introduced the Senate bill ( S. 205). The current top gift tax rate is 40 percent. Gifts are only taxed when their total value exceeds the lifetime exemption amount, which is indexed yearly for inflation—in 2017 it’s $5.49 million. There is also an annual exemption that allows individuals to make gifts of up to $14,000 per year per person tax-free. All exclusions would remain the same under the Noem and Thune bills. “My guess is that there are some people who want to keep the gift tax because if the estate tax ever comes back, they don’t want people to have made such large transfers in the absence of a gift tax that there are no more large estates to tax,” Aucutt said. Abbot Downing’s Lester Law said even if the gift tax rate were only lowered to 35 percent, there could still be a spike in gifting if reinstatement of the estate tax is imminent. In 2012, there was a significant boost in large gifts and transfers right before Congress passed the American Taxpayer Relief Act of 2012, which raised the top estate tax rate to 40 percent from 35 percent. Gift tax returns filed in 2013—which reflect the gifts made in 2012—show that total gifts grew to about $421.3 billion from $134.8 billion in the previous year’s returns, according to IRS Statistics of Income data. That’s a staggering 68 percent increase in gifted assets. The number of gift tax returns also increased by about 30 percent. Historically, lawmakers have tried to keep the gift and estate tax rates at the same level, so if the estate tax came back, it’s likely they would push the gift tax rate back up, Law said. So “if you see that the estate tax is only going to go away for short period of time, you may see another opportunity where you see people making large gifts because they’re going to be paying it at a much cheaper rate,” he said. 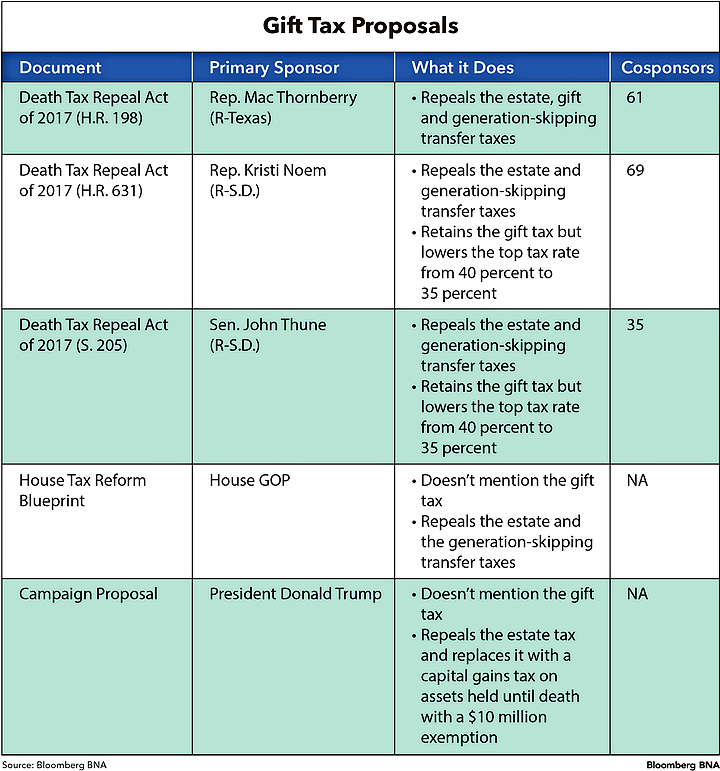 Conversely, if estate tax repeal appears to be permanent, the gift tax is retained and lawmakers keep the income tax perk known as the “basis step-up,” wealthy taxpayers may be discouraged from making gifts, Law said. The basis step-up allows a person who holds onto his or her assets until death to get a “step up” in the basis of those assets to fair market value. This reduces the amount of capital gains tax that heirs must pay on the inherited property if it is sold. In this scenario, it would be smarter—at least for tax purposes—for wealthy estate owners to hold onto their assets and get the basis step-up as opposed to gifting before death and incurring gift tax, Law said. One of the biggest clues as to whether an estate tax repeal will be temporary is if it’s passed using the fast-track budget process known as reconciliation, Law said. Reconciliation would allow Republicans to avoid a filibuster in the Senate, but the process can only be used if all changes in the proposed legislation have a direct impact on the federal budget. The drawback to using reconciliation is that it puts the permanency of any changes in jeopardy. The estate tax was temporarily repealed in 2010 as a result of President George W. Bush’s 2001 Economic Growth and Tax Relief Reconciliation Act, which was passed via reconciliation, only to be reinstated the following year.